Mix all ingredients, except blueberries, in a large bow. Stir in blueberries. Heat large pan over medium heat. Melt a little butter into the pan. Pour a little over a tablespoon of batter into the pan – I was able to do three or four at a time depending on big they ended up being. Cook for about three minutes. You will see the edges bubble just like regular pancakes, but you should check the bottoms to see how brown they are after a couple minutes. 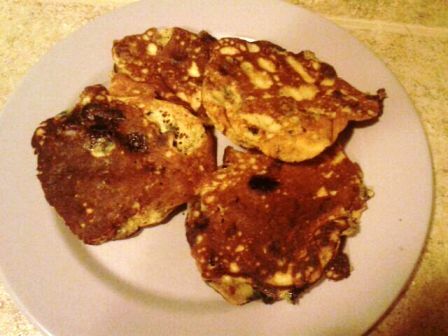 Carefully flip pancakes and cook the other side for a minute or two (check the bottom to see how brown it is). These pancakes are hard to flip because the batter stays pretty wet. Usually I have to reshape them a little, but mine didn’t turn out to be circles! These also tend to brown very quickly (as you will see in the picture). Usually I will have to turn the heat down a little after the first batch. Keep pancakes warm in a 300 degree oven while you cook the rest of the batter. I made 11 little pancakes. It probably could have been 12 or 13, but a couple of them were a little bigger. I topped mine with fresh strawberries and mango. This recipe being shard on Slightly Indulgent Tuesday.